This Pumpkin Coffee Cake recipe is an easy coffee cake to make using a can of Libbys pumpkin and Bisquick mix. A one bowl recipe, it takes only minutes to mix with a mixer or by hand. Your whole house will be filled with the wonderful aromas of pumpkin pie spice and brown sugar when you bake this coffee cake. Filled with nuts and raisins and topped with a confectioners sugar glaze, this delicious moist coffee cake is perfect to serve for Halloween, Thanksgiving, Christmas and any time in between. 2. In a large bowl, combine Bisquick mix, sugars, butter, eggs, canned Libbys pumpkin, pumpkin pie spice and milk. Beat with mixer on low speed for 1 minute, scraping bowl constantly. Beat on medium speed for 3 minutes, scraping bowl occasionally. Add nuts and raisins. Stir until combined. 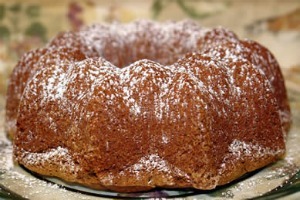 Pour batter into Bundt pan. 3. Bake for 45 to 50 minutes or until a wooden toothpick inserted into center comes out clean. Remove from oven and place on a wire rack. When pan is cool enough to handle, remove the coffee cake from the pan and cool on wire rack. 4. Prepare confectioners’ sugar glaze. In a small bowl, combine confectioners’ sugar, milk and vanilla. Stir until well combined. If glaze is too thick, add a little more milk. Drizzle on warm pumpkin coffee cake.